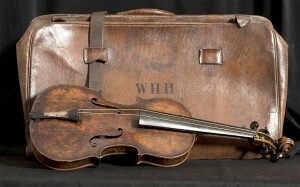 Wallace Hartley’s violin will make one last public display before its date with auctioneer Henry Aldridge & Son on 19 Oct. The violin will be going to his hometown (Dewsbury, UK) and on display for one day only on Monday, October 14 in the town hall. A vintage tea room with period music will be setup as well. 2. Rory Golden, who has been on two dives to Titanic, will be giving two talks at the former Harland & Wolff Drawing Office about his experiences diving to Titanic. The first one is scheduled for 17 Oct and the second on 18 Oct. The second talk will include Ralph White, the cameraman who captured the first images of the ship. Full details are available at Titanic Belfast. 3. Robert Ballard has begun an expedition to investigate major faults and underwater volcanoes in the northern and eastern Caribbean reports The Associated Press. Ballard is overseeing 31 scientists who hope the information they collect will help when natural disasters strike. Remote controlled vehicles will be used to explore the faults and underwater formations.